I finally finished the book 'The Life Changing Magic of Tidying Up' by Marie Kondo & it inspired me on my pursuit of minimalism. Since having babes, there has been a consistent need to clear the clutter. Not just in my home, but in my heart, my soul & my mind. I often feel that my life is fogged up by never-ending doubt, fear of failure & other negative thoughts that just aren't helpful in motherhood & in my life. Tidying up has allowed me to experience these emotions & work through them, silly as it may seem. Prayer, worship & fasting helps me to clear the fog of fear & negativity. Although these are spiritual feats, I feel as though physical clutter can sometimes hinder my ability to have a clear mind & a compassionate heart for my family & for others. I wrote this blog post before ‘Tidying Up’ with Mari Kondo on Netflix came out & I’m updating the post to confirm both how my life changed when I decided to tidy up & what I’ve seen in the faces of the families in the shows. I believe these are the emotions that I perceived from the show & possessed in my own pursuit of tidying up our home. Any time I feel guilt, I let the feeling be overcome by grace. However I do think that when grace is present, there’s an opportunity for growth. If you’re feeling guilt over consumption & overwhelm, read 2 Corinthians 12:9. Only by His power was I able to declutter & give away an entire garage full of things! I think many Americans can relate the overwhelm of having too much ‘stuff’. Taking active steps to tidy up is where I saw the most growth & it’s helped me to be conscious of our spending. Have you ever looked at your Amazon orders? I do once in a while & I’m still boggled by my purchases. It helps me determine how & where all the ‘stuff’ came from. Although decluttering is a personal choice, I have seen extreme mental health benefits from decluttering our home. When I take a bag to Goodwill, I feel more at peace. I experience more space to see my passion & purpose for people. Mari Kondo talks about holding items up to your chest & see if they spark joy & although I don’t believe ‘things’ should spark joy, I do believe we should enjoy the things in our home. Watching KonMari help families change their lives by tidying up reminds me how much this book helped me & I could relate to the joy they were feeling from my own experience. You can read all about how I finally created my life-changing minimalist wardrobe here! I like the scripture that says to keep your eyes on the things above, not on earthly things. Colossians 3:2, this helps me keep my perspective on how important my earthly 'things' are, compared to my eternal things! My review of the book 'The Life Changing Magic of Tidying Up' is similar to my review of the show Tidying Up with Mari Kondo. I believe both the book & the show lay great foundations & provide clear cut strategies on the KonMari method of how to tidy up, fold & organize things in ways that make sense. Both tell you exactly where to start & how to finish. 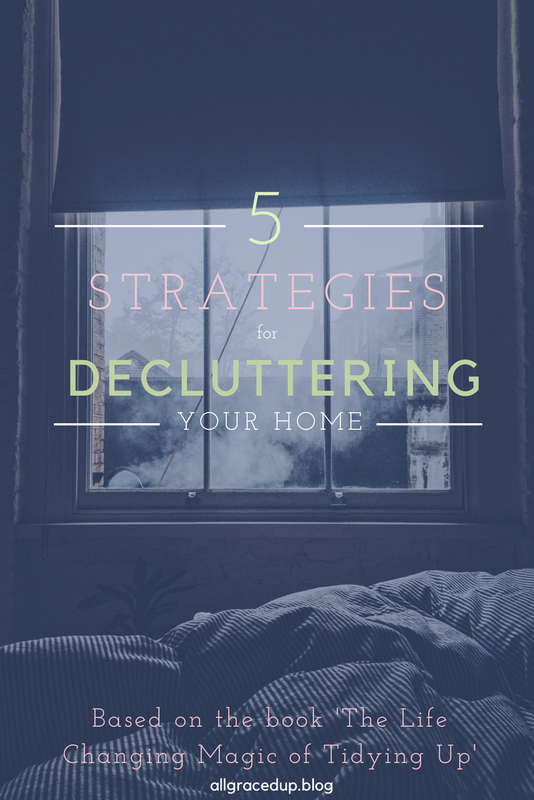 I'm excited to share with you five points that really stood out to me & have helped me in my pursuit of how to declutter like a mother. 1. Discard suddenly & not over time. Once this has been done I'll only have to tidy. I've found this to be true in most areas of our house. I feel like I've gained control over our kitchen & the bathrooms. Tidying these areas is much easier after our first move when we discarded a ton of our stuff. 2. Only keep what sparks joy. I don't always agree that we should be finding joy in things however I think it's important to enjoy the things we wear or the toys occupying space. In our new space, I only have a few pairs of earrings, my Birkenstocks, a jumpsuit, a pair of overalls & my running shoes that I cannot live without. All things that I really enjoy wearing. Things that are comfortable. Things that make me feel young & that I'm excited to put on. Oh yeah & of course I held onto my graphic t's! Head to our shops' page! Currently I feel like I've reached a skeleton wardrobe, which has taken about a year to complete. I went on the journey to clean out my closet, for good, when I was forced into a tiny house (apartment) & our whole family had to share a closet. It was so liberating to let go of it all! I'm talking bags of stuff from years ago. What helped me decide what to keep & what to get rid of was that I asked myself a couple of questions; 1. What do I need today? 2. Have you worn this in the last year? The reason the latter is important is because sometimes you need stuff according to season & just because it's not cold now, in Spring, doesn't mean it's not going to get cold come Fall. It's taken me a long time to get to this point, but it's been so liberating to only have what I'm actually going to wear. You can find a blog post I wrote on thing busy moms must have. When you think minimalist motherhood, think staple pieces, investment pieces or things you just cannot live without. This mindset has helped me keep what I love & discard what I don't. 3. I am my own standard when it comes to minimalism. Minimalism is on the rise & just because it's popular doesn't mean it's for everyone. I'm enjoying the less is more philosophy but my less may look like much more than your less. According to Marie Kondo, determiningmygoal would be the first step towards a clutter free life. Do not discard by location of the items. Only focus on my own belongings, not other people living in my house. For example, I can start with all of my own clothes, not my husband's or my kids', etc. I think this will also vary by the age of your children. Obviously small kids, who are growing out of (what seems like) everything, cannot decide for themselves what to keep. So you'll have to do this for them. 5. Decide what I'm going to keep. Instead of pulling out what you're giving away, only pull out of what you're going to keep, hold it up to your chest & see if it sparks joy. Only keep what sparks joy. I did this for the kiddos by dumping out their toys & having them pull out only what they wanted to keep (example below). It helped except when my son said he wanted to keep everything, ha! I then told him he could keep it if he could fit it into his drawers, we compromised. I've only touched on a few things from the book however, there are so many more helpful techniques, stories & tips she shares! She references Japanese culture & you can find relatable topics on Pinterest by searching KonMari methods or tidying up. All points are inspired by this book! Disclaimer: There are affiliate links included in this post. If you make a purchase by clicking the links in this post, it may result in a small commission to me. follow along on my faith filled journey via instagram!